Hi Fyodor Mikhailovich Dostoevsky (ha Ruso: Фёдор Миха́йлович Достое́вский, nga an apelyido ginsusurat gihapon nga Dostoyevsky, Dostoievsky, Dostoyevskiy o Dostoevski) (Nobyembre 11 [D.E. Oktubre 30] 1821–Pebrero 9 [D.E. Enero 28] 1881) usa nga Ruso nga nobelista ngan manunurat hin fiksyon nga an mga sinurat, upod an Pagtalapas ngan Pagsirot ngan An Mga Magbugto nga Kalalakin-an nga Karamazov, mayda hilarom ngan maiha nga epekto han intelektwal nga panhunahuhan ngan literatura han kalibotan. An sinurat ni Dostoevsky nagsusubay han psikolohiya han katawhan han masamok nga politika, sosyal ngan ispiritwal nga kontexto han iya sosyudad ha Rusya han ika-19 nga siglo. Ginkikitâ hiya nga amo an nagtukod o kondi man an nahauna han existentialismo han ika-20 nga siglo, an iya Mga Sinurat tikang ha Sirong (1864), nga sinurat han mapait nga tingog han waray-ngaran nga "tawo ha sirong", gintawag ni Walter Kaufmann nga amo an "gimaupayi nga overture nga ginsurat para han existentialismo." Belinsky, Vissarion (1847) (ha Russian). Polnoye sobranye. 10. Bloshteyn, Maria R. (2007). The Making of a Counter-Culture Icon: Henry Miller's Dostoevsky. G – Reference, Information and Interdisciplinary Subjects Series. University of Toronto Press. ISBN 978-0-8020-9228-1. Breger, Louis (2008). Dostoevsky: The Author As Psychoanalyst. Transaction Publishers. ISBN 978-1-4128-0843-9. http://books.google.com/?id=vxX2JGsN7PoC&printsec=frontcover#v=onepage&q&f=false. Burry, Alexander (2011). Multi-Mediated Dostoevsky: Transposing Novels Into Opera, Film, and Drama. Northwestern University Press. ISBN 978-0-8101-2715-9. http://books.google.com/?id=lfLnzvLaB-kC&printsec=frontcover#v=onepage&q&f=false. Frank, Joseph (1981). "Foreword". In Goldstein, David I.. Dostoevsky and the Jews. University of Texas Press. ISBN 0-292-71528-5. Jones, Malcom V.; Terry, Garth M. (2010). New Essays on Dostoyevsky. Cambridge University Press. ISBN 978-0-521-15531-1. Meier-Gräfe, Julius (1988). Dostoevsky: The Man and His Work. Frankfurt am Main: insel verlag. Lantz, Kenneth A. (2004). The Dostoevsky Encyclopedia. Westport, Connecticut: Greenwood Publishing Group. ISBN 978-0-3133-0384-5. http://books.google.com/?id=XfDOcmJisn0C&printsec=frontcover#v=onepage&q&f=false. Mochulsky, Konstantin (1967) . Dostoevsky: His Life and Work. Trans. Minihan, Michael A. Princeton: Princeton University Press. ISBN 0-691-01299-7. http://books.google.com/books?id=mDKphT8_XLsC. Lauer, Reinhard (2000) (ha German). Geschichte der Russischen Literatur: von 1700 bis zur Gegenwart. Munich: Verlag C.H. Beck. ISBN 978-3-406-50267-5. Lavrin, Janko (2005). Dostoevsky: A Study. Kessinger Publishing. ISBN 978-1-4179-8844-0. http://books.google.com/?id=57iTq6YSJbcC&printsec=frontcover#v=onepage&q&f=false. Leatherbarrow, W. J. (2005). A Devil's Vaudeville: The Demonic in Dostoevsky's Major Fiction. Northwestern University Press. ISBN 978-0-8101-2049-5. Leatherbarrow, W. J. (2002). The Cambridge Companion to Dostoevskii. Cambridge University Press. ISBN 978-0-5216-5473-9. Müller, Ludolf (1982) (ha German). Dostojewskij: Sein Leben, Sein Werk, Sein Vermächtnis. Munich: Erich Wewel Verlag. Neuhäuser, Rudolf (1993) (ha German). F.M. Dostoejevskij: Die Grossen Romane und Erzählungen; Interpretationen und Analysen. Vienna; Cologne; Weimar: Böhlau Verlag. ISBN 978-3-205-98112-1. Paperno, Irina (1997). Suicide As a Cultural Institution in Dostoevsky's Russia. Cornell University Press. ISBN 9780801484254. Reber, Natalie (1964) (ha German). Studien zum Motiv des Doppelgängers bei Dostojevskij und E.T.A. Hoffmann. Gießen. Shrayer, Maxim D. (2004). Jackson, Robert Louis. ed. A New Word on The Brothers Karamazov. Northwestern University Press. Terras, Victor (1998). Reading Dostoevsky. University of Wisconsin Press. ISBN 978-0-2991-6054-8. http://books.google.com/?id=4nV9o8k9y34C&printsec=frontcover#v=onepage&q&f=false. Terras, Victor (1969). The Young Dostoevsky (1846–1849): A critical study. Slavistic printings and reprintings. 69. University of Michigan. Williams, Rowan (2008). Dostoevsky Language, Faith and Fiction. Baylor University Press. ISBN 978-1-602-58373-3. Bloom, Harold (2004). Fyodor Dostoevsky. Infobase Publishing. ISBN 978-0-7910-8117-4. http://books.google.com/?id=1C1K-BnFGFIC&printsec=frontcover#v=onepage&q&f=false. Frank, Joseph (2009). Dostoevsky: A Writer in His Time. 1–5. Princeton University Press. 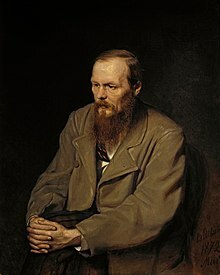 ISBN 978-0-691-12819-1. http://books.google.com/?id=lp1RpM8o9BQC&dq=fyodor+dostoevsky++biography. Frank, Joseph (1979) . Dostoevsky: The Seeds of Revolt, 1821–1849. Princeton: Princeton University Press. ISBN 978-0691013558. http://books.google.com/books?id=pDEAXltygUIC. Frank, Joseph (1987) . Dostoevsky: The Years of Ordeal, 1850–1859. Princeton: Princeton University Press. ISBN 978-0691014227. http://books.google.com/books?id=K98hhw0IEHgC. Frank, Joseph (1988) . Dostoevsky: The Stir of Liberation, 1860–1865. Princeton: Princeton University Press. ISBN 978-0691014524. http://books.google.com/books?id=QJj6qb6Rh3AC. Frank, Joseph (1997) . Dostoevsky: The Miraculous Years, 1865–1871. Princeton: Princeton University Press. ISBN 978-0691015873. http://books.google.com/books?id=iAs4Lz5yog0C. Frank, Joseph (2003) . Dostoevsky: The Mantle of the Prophet, 1871–1881. Princeton: Princeton University Press. ISBN 978-0691115696. http://books.google.com/books?id=mQqonU-pweEC. Kjetsaa, Geir (15 January 1989). A Writer's Life. Fawcett Columbine. Lavrin, Janko (1947). Dostoevksy. New York: New York The Macmillan Company. OCLC 646160256. Evdokimov, Paul (1984) . Gogol et Dostoievsky: la descente aux enfers (2nd ed.). Desclée De Brouwer. ISBN 978-2-2200-2485-1. Bercken, Wil van den (2011). Christian Fiction and Religious Realism in the Novels of Dostoevsky. Anthem Press. ISBN 978-0-85728-976-6. http://books.google.com/?id=mFFFtwjQnigC&printsec=frontcover#v=onepage&q&f=false. Jones, Malcolm V. (2005). Dostoevsky And the Dynamics of Religious Experience. Anthem Press. ISBN 978-1-84331-205-5. http://books.google.com/?id=L52TNlWprfcC&printsec=frontcover&dq=dostoevsky+and+dynamics#v=onepage&q&f=false. Cassedy, Steven (2005). Dostoevsky's Religion. Stanford University Press. ISBN 0-8047-5137-4. http://books.google.com/?id=DI4FUgZJ1kkC&printsec=frontcover#v=onepage&q&f=false. Pattison, George; Thompson, Diane Oenning (2001). Dostoevsky and the Christian tradition. Cambridge University Press. ISBN 978-0-5217-8278-4. http://books.google.com/?id=GlLm4gbPZdQC&printsec=frontcover#v=onepage&q&f=false.